This incredible bridge sets a stunning scene in this image, displaying the fantastic slate grey stone work of the bridge as a piece of art. The bridge looks very old and has a sense of history and you almost wonder what this bridge has seen. In fact the bridge is located in the south of England taken by one of our team believe it or not whilst on a family walk. The location is irrelevant though because we all know a bridge like this from personal sights or from the movies so you and the recipients of these e Christmas cards for business if you choose it for your business will all relate to it in some way. The white frost glows on the stones, and the snow along the bridge pathway glistens. The reflection of the water looks truly lovely, radiating light and the trees in the background of the image are simple and bare demonstrating Winter has truly arrived. 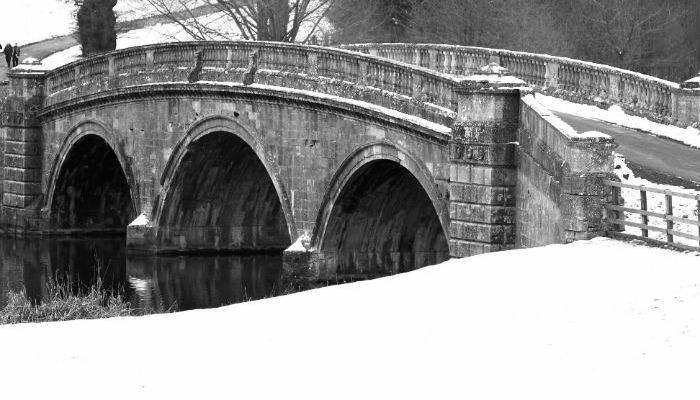 We always find at eC02 Greetings that our images set in a bridge scene are the most popular. We have many different Christmas ecards for business designs to choose from. Please do not hesitate to browse our selection of bridge scenes and many more and send ecards for business this year with eC02 Greetings.